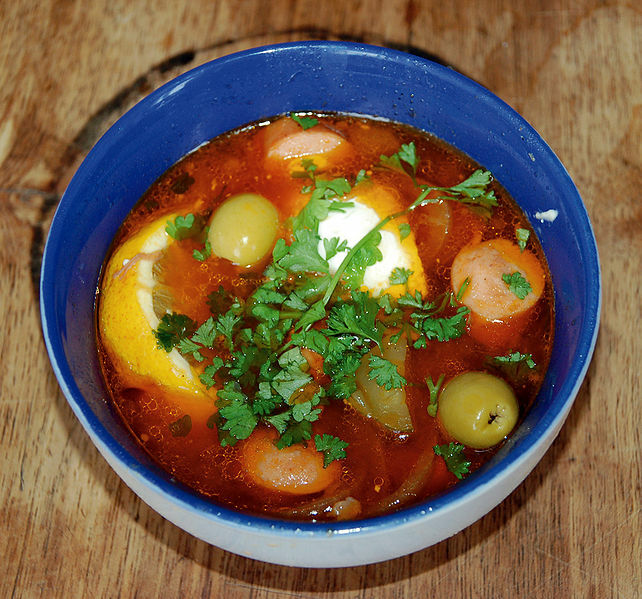 Solyanka (Russian: солянка) is a thick, spicy and sour soup in the Russian and Ukrainian cuisine. There are mainly three different kinds of solyanka, with the main ingredient being either meat, fish or mushrooms. All of them contain pickled cucumbers with brine, and often cabbage, salty mushrooms, smetana (sour cream) and dill. The soup is prepared by cooking the cucumbers with brine before adding the other ingredients of the broth. For meat solyanka, ingredients like beef, ham, sausages, chicken breasts, and cabbage, together with salty mushrooms, cucumber pickles, tomatoes, onions, olives, capers, allspice, parsley, and dill are all cut fine and mingled with cream in a pot. The broth is added, and all shortly heated in the stove, without boiling.